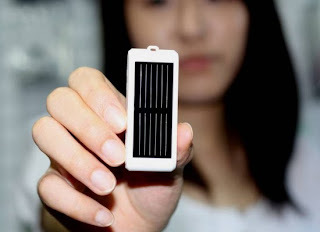 This funky little gadget called the SunDrive is a USB solar charger. Yep, that's a tiny little solar panel that can store enough energy to recharge your digital devices -- camera, cell phone or MP3 player. According to the manufacturer, it can recharge your device with 35 hours of power and your cel with 100 mins of talk time. AND it's a USB stick, available in 2,4,8, and 16 GB. What a fantastic way to recharge your devices for free! And in a green way! The really kewl part is that it only costs $23 USD. Plus shipping from Korea. Have you seen any other affordable portable solar technologies? Leave a comment!